I found this meal kit (in the picture below) at Duane Reade and it immediately caught my eye because I used to be an avid Blue Apron-er. They had me at "20 minutes prep-to-plate" because I don't always have time to cook a healthy meal, when I get home from work late. Here's a PDF version of the recipe. Let's start with the sweet potatoes, since they'll take the longest to cook... So, I didn't exactly follow the recipe for this part because I wasn't in the mood for mashed potatoes. Preheat your oven to 425 degrees. Slice those potatoes into thin chips, to be laid out and seasoned across a baking tray drizzled with oil (covered with a sheet of tin foil). 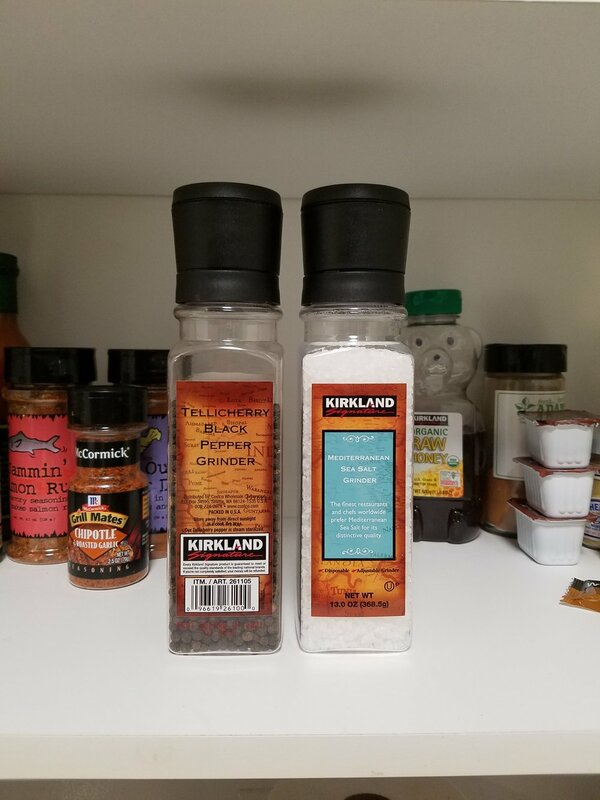 Going forward with this recipe, I do advice using some salt and pepper, as the recipe also calls for it. But, do NOT go overboard with the salt. It's not healthy and you'll ruin the flavor. Season the sweet potatoes with a pinch of salt (or none) and some pepper. 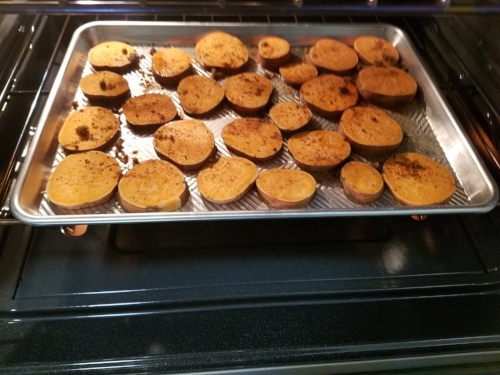 Then, let the seasoned sweet potatoes bake for about ten minutes on 425 degrees. 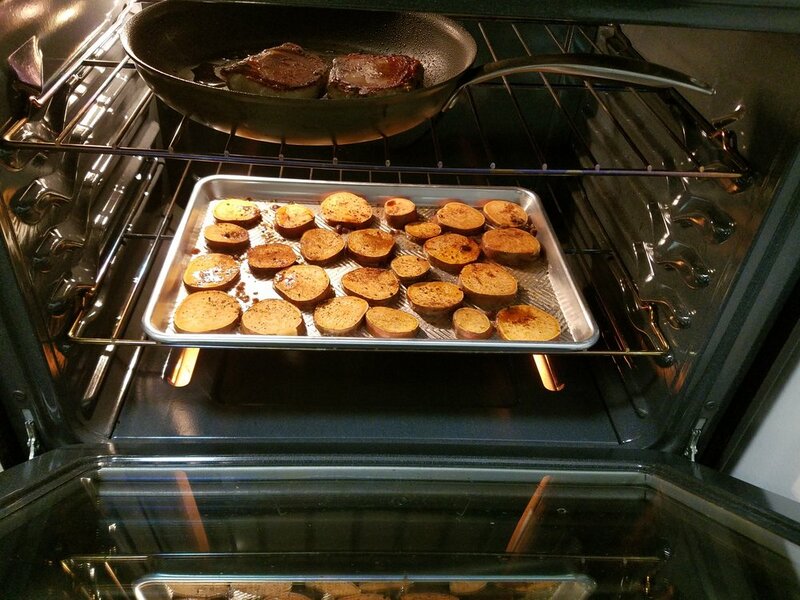 After potatoes have baked for a bit, carefully take out of the oven and season with some brown sugar and nutmeg (optional). Now, toss them back in the oven, while you work on your pork loins. Just a tip... don't watch the food cook. It doesn't help the process move along any faster. Move onto the next step of the recipe, while the other components are cooking. This is where being multitaskular (not a word) comes in handy. 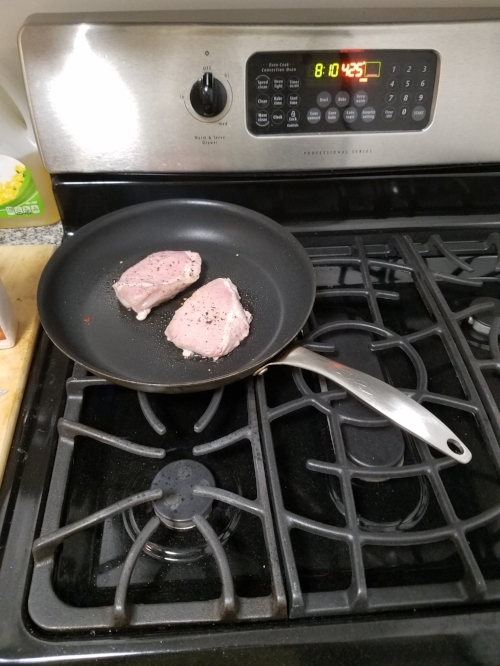 Pan sear the pork loins with a tiny bit of salt, as much pepper as you'd like, and a tablespoon of Olive Oil. I ran out of Olive Oil, so I used Canola oil instead. In my opinion, using different cooking oils don't affect the flavor of whatever you're cooking. 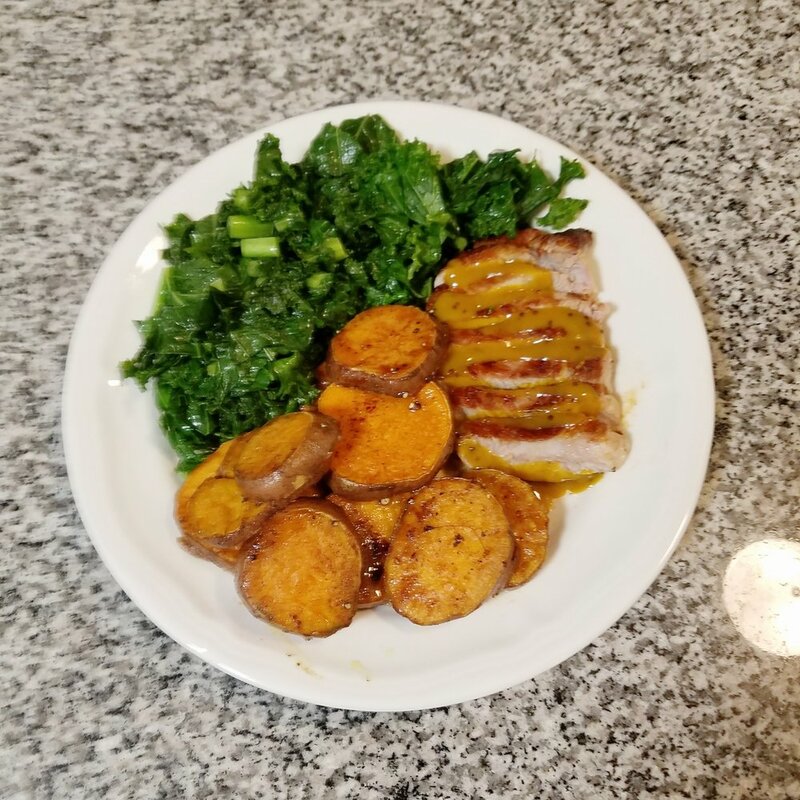 After you've browned both sides of each pork loin, carefully place the entire pan (with the pork loins in it) into the oven with your sweet potatoes. Let the pork loins roast for another 5 minutes or so. 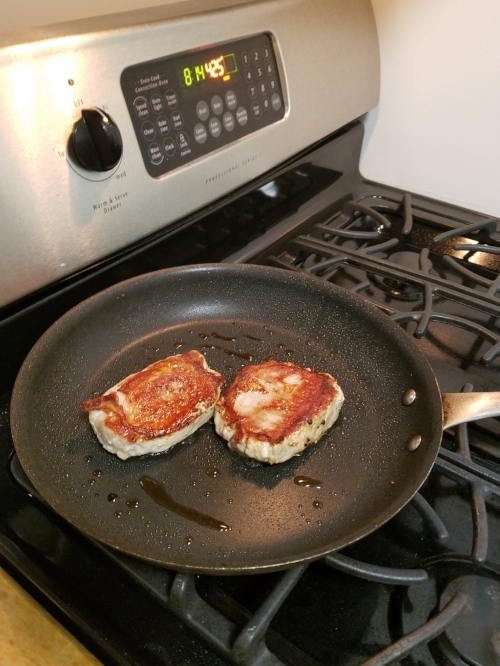 I know the recipe only calls for 3 minutes, but you can never be too carefull with meat. Unfortunately, the swiss chard included in this meal kit was not so fresh. 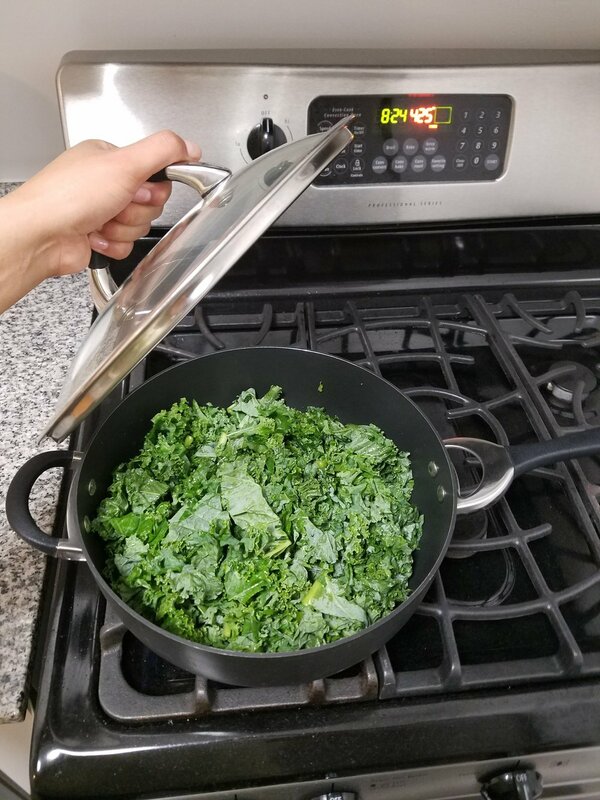 So, I substituted the rotten greens with some nice, fresh kale to go along with my meal. More importantly, wash the kale under cold water, like you should with all fruits and vegetables. 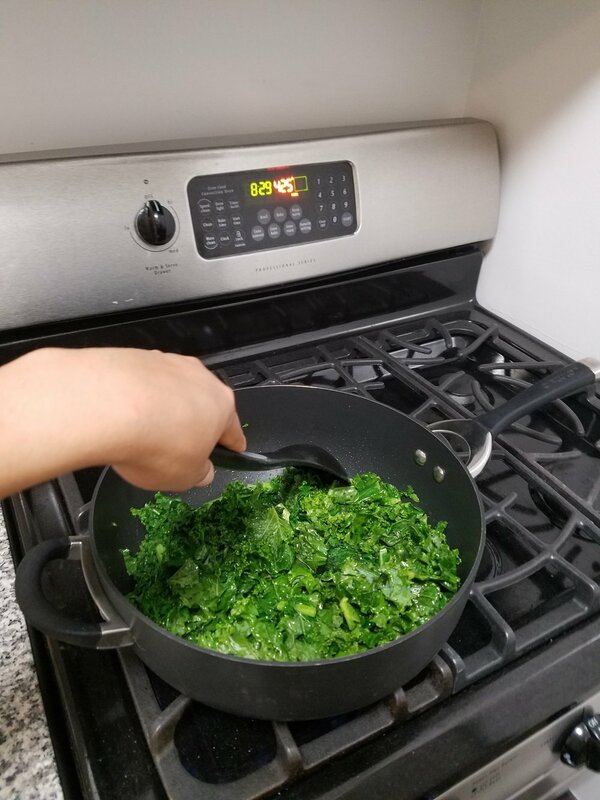 Cooking the kale... nothing fancy, just pour about a tablespoon or two of oil into a pan, maybe brown some garlic, before tossing your chopped kale in there, and top off with some salt-n-pepa. Just a tip... don't go overboard with the oil (like ever). 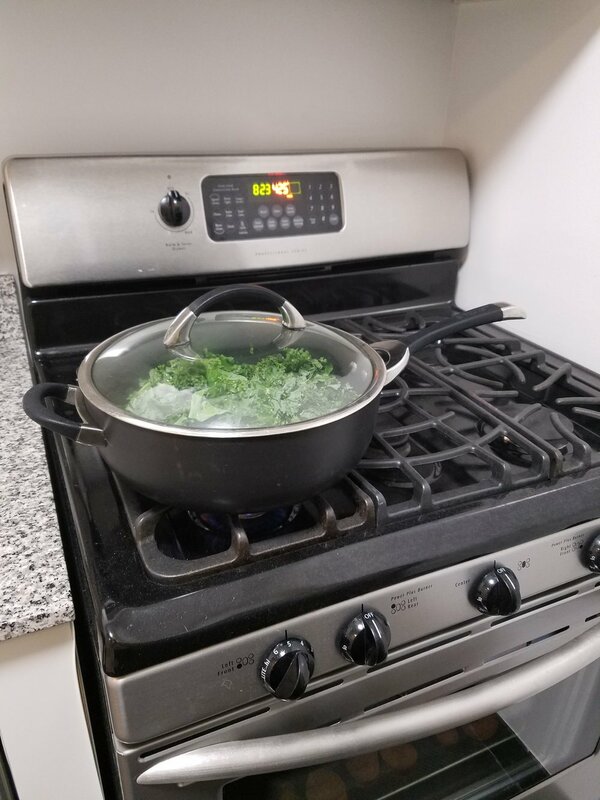 After the kale has cooked on Medium heat for about twenty minutes, turn off the stove and let sit, until the rest of the meal is ready. 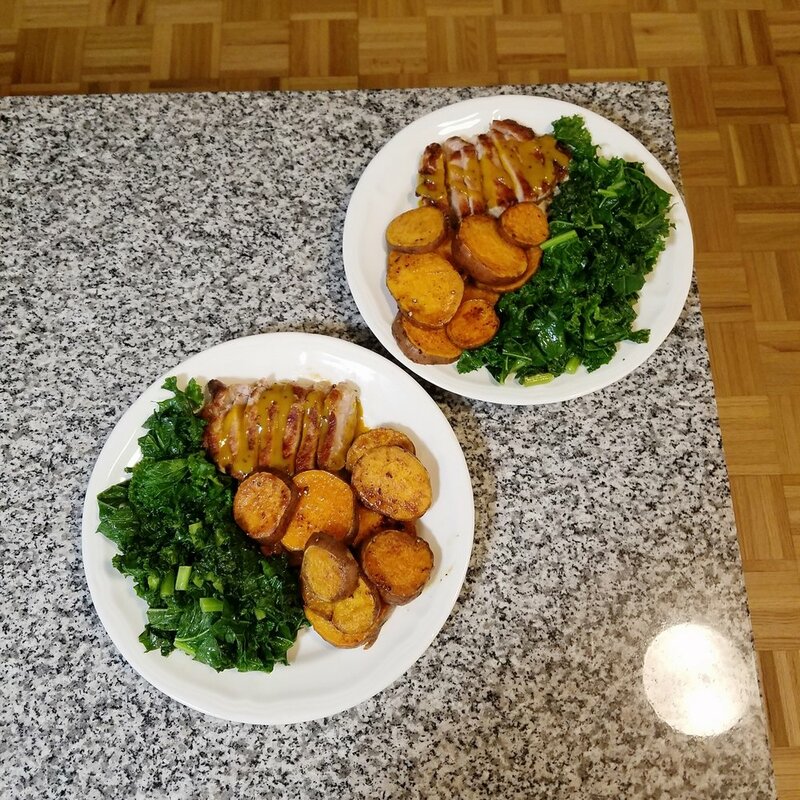 Once kale is cooked, shift your focus right back to your meat and potatoes. Turn of the oven and remove the pork loins and the sweet potatoes. Let the food cool off just a tad... those sweet potatoes should be pretty darn hot. Split the food evenly between two plates. Maybe you're guest won't notice that you served yourself a smidge more. That's your choice. Oh, and don't forget to share pictures of your meal on Pinterest, before you devour it! And why not IG, while you're at it. Chef'd recommends a wine pairing of Pinot Noir. And if you're not a wine drinker, try a pale ale with this meal. Don't forget to clean up! 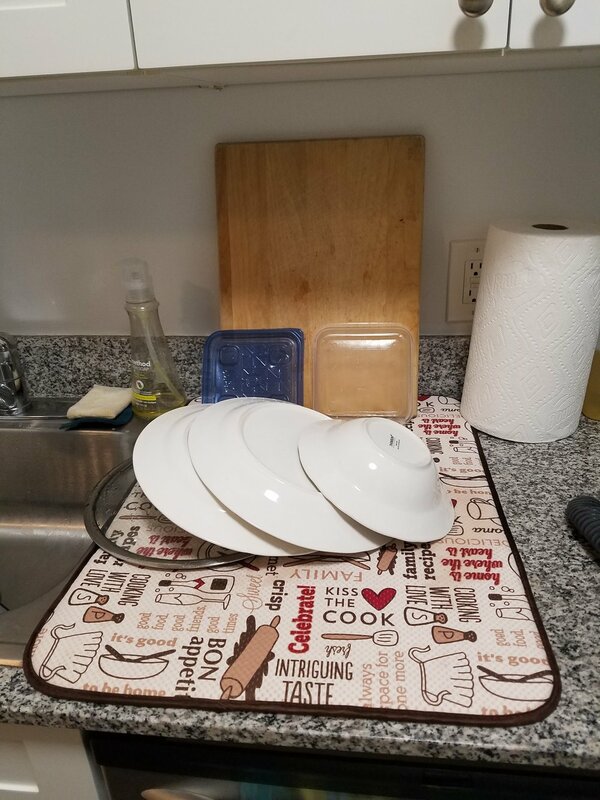 Leave those dirty dishes for the mister.